An 18ct yellow gold antique Victorian era half hoop ring featuring five old cut Diamonds, claw set along the top of the pierced and hand engraved scrollwork gallery incorporating decorative upswept shoulders that join the divided under rails of the top mount and form a 2.1mm wide shank that tapers to 1.6mm in width at the base of the band, stamped 18ct. Total Diamond weight: (5) = 0.82ct. Graded in mounts. Colour: I-J. Clarity: SI-P. Weight approximately: 3 grams. 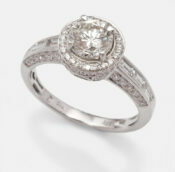 Independant Valuation for Insurance available from a registered Jewellery Valuer (NCJV) and supplied on request.